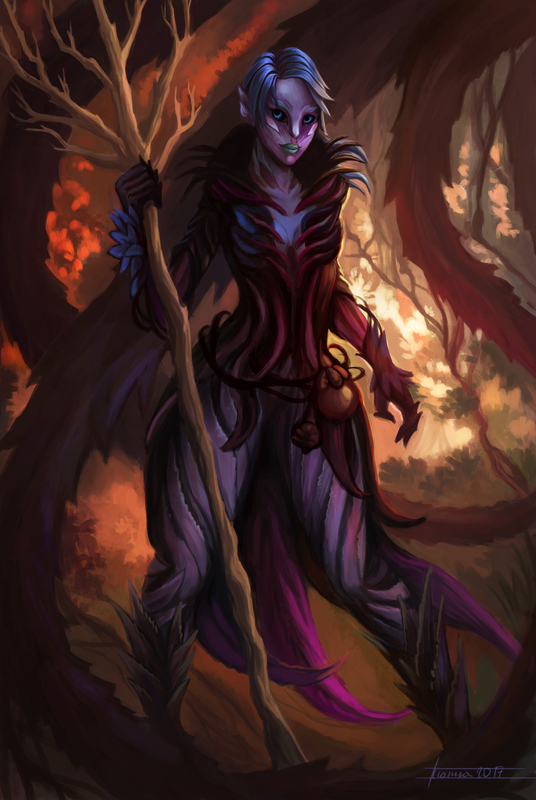 Twenty-four years ago a brown barked sylvari with mossy green fronds stepped from her pod. This is not who the Duchess is, this is who the Duchess was. Siofrha stepped out of her pod and spent her days in the Grove, learning of the Tablet, of Tyria, of Nature Magic, and of Growing. Six years pass. The brown barked Grower had spent her time as a Grower. In time she longed for something more. She joined the Wardens, there she learned to fight, she learned how to wield a blade, she learned how to wield her magic against foes. Two years pass. The Warden with her mossy green fronds was captured by The Nightmare Court. Comrades dies, others were captured. This group was viscous, even for the Court. The captives were whipped until death or conversion. The Warden with the brown bark and the mossy green hair converted. Two years pass. The mossy green fronds lost their luster, the brown bark bears the scars left from many whips. She endured, she became a squire. One year passes. The Squire with her dull green fronds and the scarred brown bark undergoes her trials. She emerges a Knight. She titles herself with her magic in mind. She became the Knight of Twisted Vines. Three years pass. The Knight has changed her fronds, the green reminds her too much of her former life. The Knight with the dull black fronds ascends in rank. She became the Ebon-Knight of Twisted Vines. Two years pass. The Ebon-Knight with her black fronds has changed her brown barky skin to a smooth, leafy red skin. She has left her old Court for one out East, in Sparkfly Fen. There she became the Baroness of Twisted Vines. Two years pass. The red skinned Baroness with the dull black fronds has witnessed the death of her Dearheart. She has dulled her emotions, taken control of her emotions. With her promotion she makes a decision on her title. She became the Countess of Callous Intent. One year passes. It is uneventful. She remains cold and callous. Her title remains true and poignant. She ascends further. She became the Marquise of Callous Intent. Three years pass. Her Court is destroyed. Her Duke dead from his wounds. Almost every death was before her own eyes. She withdraws from the world. Then she is given a Dark Hunt, one which requires a court. She became the Duchess of Callous Intent. Two years pass. She is gone from her Court. She wanders, a free Courtier. She is given another Dark Hunt. She will found a city of Nightmare. She becomes what she is today, not just a Duchess, but a leader. She remains the Duchess of Callous Intent, yet more than that. And that is the rise of Siofrha.